I do not do anything except with a pure and sincere heart. I do not care for anyone’s approval or disapproval. I want no one to be hurt by me. You must first have the mind for love, then the heart for it. Think not of the comforts and difficulties of love. Take to the sea and ask not where the shore is. O moon-like Sâqi*, give me wine in this month of fasting. For fasting became forbidden to me now. Of your eyebrow and the full moon of your face. The spirit is intoxicated when it sees the belovéd’s face. Any nonbeing becomes being – by his existence. Goes from one hand to another in the feast of life. I have drunk the water of life from my belovéd’s lip. I have drunk the wine of spirit from the cup of unity. I know neither disbelief nor belief. I have tied belief and disbelief with the knot of love. 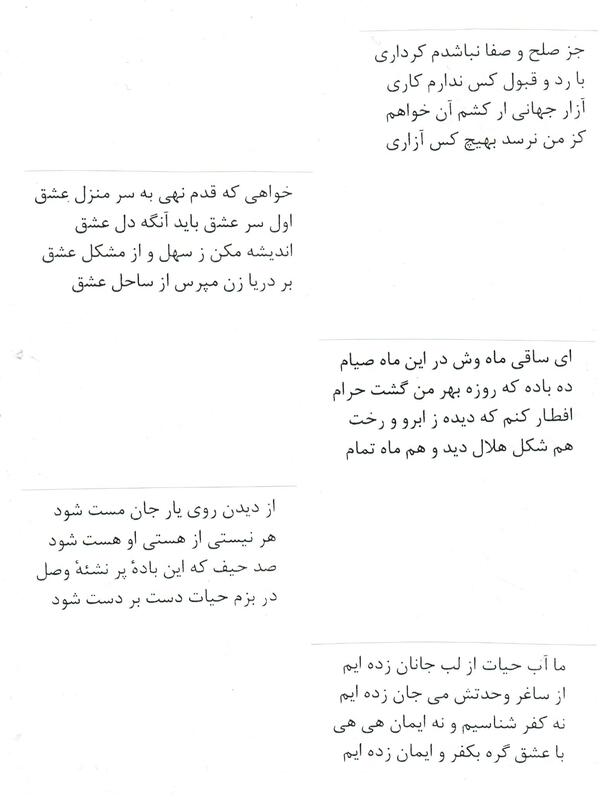 Jalâl Behizâd (#4), Hushang Hekmati (Sarvi) (#5).